Growing switch to polyester carpets puts recycling at risk. Aquafil USA, part of Italian-based Aquafil S.p.A. (Trento, Italy) will open production of second carpet recycling plant in the U.S—in Woodland, CA soon to harvest Nylon 6 from nylon-based carpets to regenerate the nylon fraction into new ECONYL® yarns for new carpets. The $12 million, 120,000-square-foot plant, when production reaches full peak, will add 50 new jobs and bolster the recycling infrastructure needed to help recycle the millions of tons of carpet that are discarded by Americans annually (https://wasteadvantagemag.com/carpet-recycling-op-ed-and-analysis/?fbclid=IwAR104LcfTEmVb0GRMdnYaEJOgu7jvBzda6OYqo0pxpvEeWgr8jv_997l0J8) that either end up in landfills or are used as a fuel source for industry, which generate green house gases. Based in Cartersville, GA, Aquafil USA was started 20 years ago by Franco Rossi and now has two productions factories in Cartersville and two carpet recycling plants in Arizona and California. The area around Carterville is considered to be the carpet manufacturing capital of the world. In fact, more than 100 carpet manufacturers in Georgia purchase Aquafil’s recycled Nylon 6. The most valuable component of used carpet is Nylon 6, a high-value yarn. The recovered nylon is sent to Aquafil’s ECONYL® regeneration plant in Slovenia to become new Nylon 6, called ECONYL®, which is 100 percent regenerated and infinitely regenerable and used for both carpet flooring and garments. 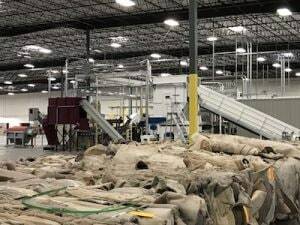 When the Woodland plant reaches full capacity—36 million pounds of carpet annually, it will be able to disassemble and separate a nylon-based carpet to its components within 30 minutes. 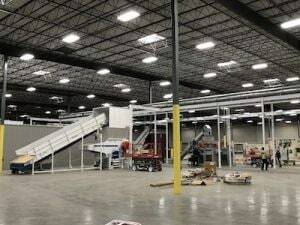 The Phoenix plant opened last April and production at that location is increasing. Aquafil’s parent company has 16 plants in eight countries, including Italy, Slovenia, Germany, UK, Croatia, China and Thailand. 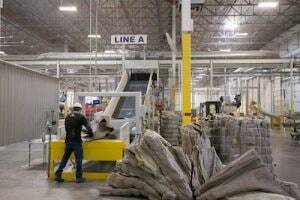 The California plant, which employs wet and dry measures to deconstruct carpets, is also environmentally-friendly. The water can be re-used, and renewable energies are maximized. In Arizona, carpet recycling does not receive any subsidies, but in California, carpet retailers have been charging 35 cents per-square yard of new carpets that they sell. The assessment started in 2011 at 5 cents per square yard after passage of AB 2398, with subsequent increases to reach the current 35 cents as of January 1, 2019 (https://carpetrecovery.org/california/). Having states bring in EPR legislation is just one aspect of the many conditions required to recycle carpets in America, and many recycling groups and associations are working hard to have as many states as possible enact them. Rossi is very concerned about another situation that is literally throwing a spanner into the works and could seriously derail overall efforts to recycle carpets in the U.S.—the move from nylon to polyester-based carpets over the past seven years. This is already having an impact on firms collecting the carpet because their work is made more difficult via the separation process and they have fewer viable products to sell to Aquafil and other companies. A key question that all should ask, particularly when there is a growing environmental awareness and recycling ethos, is why governments are permitting a product to be manufactured that cannot be recycled? It is not as if a large percentage of people and governments are unaware of the problem that polyester carpets pose now and in the future. What can be done in terms of recycling polyester? So far Rossi stressed that the situation looks bleak.“The only solution at the moment is to use the fiber as such in what are called agnostic applications, where the ingredients used doesn’t matter because it’s only used as insulation, pads, inexpensive fabrics, and some decking material,” he said. “These products need a material that melts easily or is fluffy. But once the material is used for this application, there is no way to recover it again and so it’s not the ideal in the future circular economy scheme. Praising the efforts of Rossi and Aquafil USA is a given as the company is demonstrating that one can move forward with profit-based actions to help protect the environment. This company and a host of others and potential entrepreneurs are keen to create the infrastructure needed to recycle consumer and commercial products and the markets for the recovered materials. Hopefully, other states will recognize some of the root issues with regards to carpets and recycling and pass carpet EPR legislation to build on what California has done to increase the number of green jobs in their state and regionally.